ITS•MARC offers catalogers easy access to 63 million MARC records, using the fastest search technology in the library industry.ITS•MARC offers four access methods: www.itsmarc.com, Z39.50, DVD, and integration with TLC’s LS2 Cataloging. At one low, fixed price per year, you can search and find high-quality bibliographic and authority records. Book jacket images, tables of contents (ToCs), and reviews are included with the Web service. Jacket art can be viewed with properly equipped Z39.50 cataloging software, such as TLC’s BiblioFile. The images enable you to quickly verify a record match, while ToCs and reviews help with classification and subject assignment. BiblioFile, our standalone MARC editor, is available with an ITS•MARC subscription. BiblioFile features multi-lingual cataloging, result set filtering, Z39.50 client, local authority verification, label printing, and other advanced features. 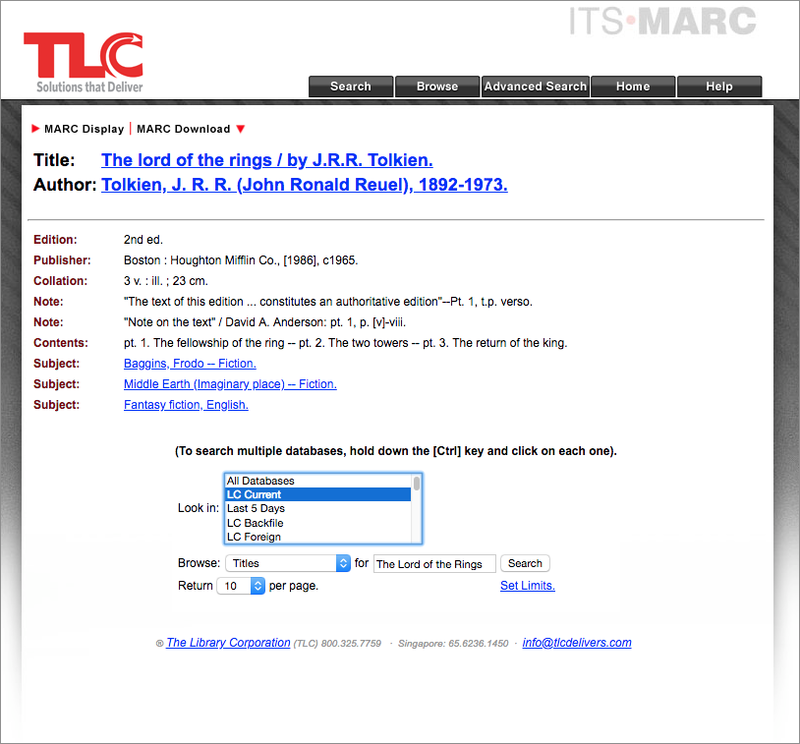 For those who require the functionality of a web-based, Integrated Library System, ITS•MARC access is fully integrated with TLC’s new, powerful, and user-friendly LS2 Cataloging. ITS•MARC is updated daily with records from the Library of Congress. Other databases are updated weekly, monthly, or quarterly with records from the National Library of Medicine, National Library of Canada, British Library, U.S. Government agencies, Baker & Taylor, Professional Media Service, and contributing TLC customers. TLC offers these databases via www.itsmarc.com, Z39.50, and DVD. LC MARC English – Complete Library of Congress English language MARC database. LC MARC Foreign – MARC database of non-English holdings cataloged by the Library of Congress. Canadian MARC – Records cataloged by the National Library of Canada. Contributed School and Public Libraries – Records from TLC users in public libraries and school systems. Contributed Research and Academic Libraries – Records from TLC users in research and academic institutions. Includes over 600,000 pre-1968 records. French MARC – French language titles cataloged by the Library of Congress, other national libraries, and TLC libraries. Docufile – Government documents database, including publications of U.S. state, U.S. federal, and foreign governments, as well as the United Nations. MedMARC – Medical and related bibliographic records from the National Library of Medicine and other national libraries. NewPubMARC – Contains records of materials with publication or MARC creation dates of two or fewer years ago. Spanish MARC – Distinctive MARC database with Spanish language titles cataloged by the Library of Congress, other national libraries, and TLC libraries. TheoMARC – Records from theological and national libraries. Authorities: LC Names and Subjects, Sears subjects, and Medical Subject Headings (MESH). TLC Authorities are only available via Z39.50. TLC offers premium databases (at additional cost) to expand your copy cataloging resources. A/V Access – Records of professionally cataloged popular audio and visual materials. British MARC – Records from the British Library. EF Sears – Records compiled by EF Library Services LLC that use Sears subject headings for titles commonly found in school and small public libraries. School•MARC Sears – Contains content-rich MARC records with Sears subject headings. School•MARC LC – Contains content-rich MARC records with LC subject headings.